She is the greatest warrior the world has ever seen; a guardian of peace and justice with the power of a goddess. But even Diana of Themyscira--the superhero better known as Wonder Woman--is entitled to a little downtime. And after the incredible trials she's just endured, she could use it. But when she goes to a wedding with her best friend Etta Candy, all hell breaks loose. 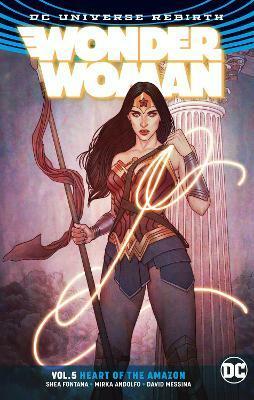 A madwoman's attack on the reception ignites an all-out war for Wonder Woman's most precious resource: the DNA that makes her an Amazon. It could be a miracle cure...or a doomsday weapon. Find out in Wonder Woman Vol. 5: Heart of the Amazon, from best-selling author of DC Super Hero Girls Shea Fontana and artists Mirka Andolfo and David Messina, and featuring additional work from Tim Seeley, Inaki Miranda, Christian Duce and more. Collects Wonder Woman #26-30, Wonder Woman: Steve Trevor #1 and stories from Wonder Woman Annual #1. Shea Fontana is a screenwriter for film and television, as well as a comic book writer. Her work includes the first original graphic novel in the DC SUPER HERO GIRLS line, as well as TV shows THE 7D, DOC MCSTUFFINS, WHISKER HAVEN TALES WITH THE PALACE PETS and more.